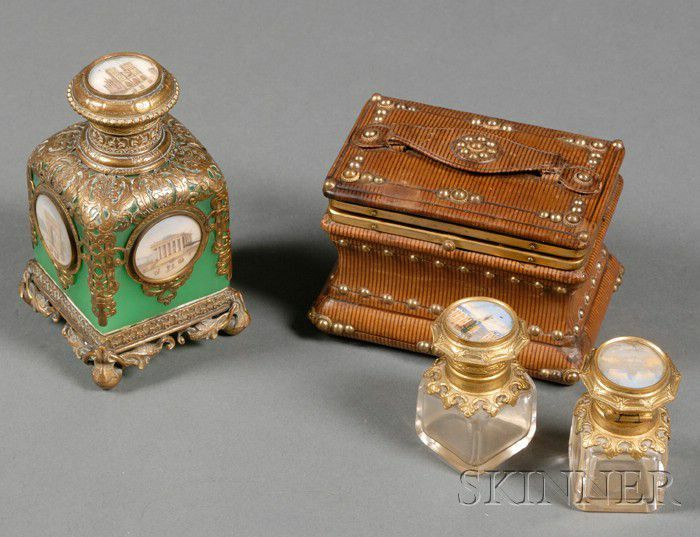 Two Grand Tour Perfume Sets, mid 19th century, comprising an Italian leather-covered two bottle perfume set, tooled brown calf casket with top lifting handle and decorative brass tacking with moire and velvet-lined interior containing two small colorless, square-section bottles with gilt metal lids set with small gouache scenes under glass of Italian cities, bottle ht. 2 1/8, casket wd. 4, ht. 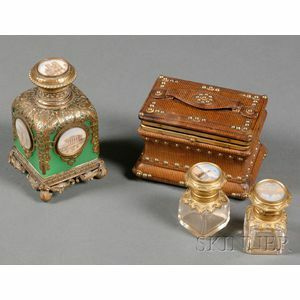 3, and a French apple green opaline glass bottle with pierced and engraved gilt metal mounted, square section with sloped shoulders, on ball feet, set to each side and to lid with small gouache painting under glass of scenes of Parisian sights, ht. 4 1/4 in. leather-covered: one bottle with significant moisture damage to the painted scene; the other with light lifting to paint. minor age darkening to gilt metal. casket with repaired breaks to handle, restorations to leather at right front corners, a few nicks to calf, a few spots of light soiling, age darkening to calf. french glass: two painted roundels with some white bloom to interior of glass. minor age darkening of metal, otherwise good.